Authors Note: I originally did this test and wrote this article back in the early 1970's. While it is still valid, we could use a newer test. How about some of you? Set something up, take photos, record all the measurements and send it to us. Most people who shoot for very long soon begin wondering about the power of their guns. When the bullet strikes its target how hard does it hit ? What is the effect? Is it more powerful than...? Every once in a while "discussions" get going as to which gun/load/caliber "hits the hardest" or words to that effect. The question is basically the same no matter how it is phrased. Ammunition companies have supplied kinetic energy figures with their ballistics data for years. This is in the form of "foot-pounds" of energy, usually written as "ft. lbs." in the manuals. And when you read that the .308 has 2460 ft. lbs. of energy at the muzzle compared to 1350 ft. lbs. of energy for the .44 Magnum sixgun, it looks like the .308 would be LOTS more effective at killing deer or game than the .44 would be. But... as with most things, there is a problem with the foot-pounds theory of bullet energy. To begin with, the definition of "foot-pounds" is: "a unit of energy, equal to the amount of energy required to raise a weight of one pound a distance of one foot." (Webster's) Anyone who has ever played around with firearms for very long has discovered that a gun with "2000 ft. lbs." of muzzle energy will not move 100 pounds sideways 6" let alone lift it a foot! Here's an experiment for you to try. Fill a 5 gallon bucket full of sand. Set it on the ground and shoot it with your rifle that has over a ton of muzzle energy. Let me know if it moves it all. If the foot-pounds idea were correct, the bucket would go flying. But it will not. Suspend it on rope 3 to 4 feet long, and shoot into it with your super-duper belch-fire Magnum and see how far it moves it. Not much I can tell you right now. Lest you think I am against using kinetic energy measurements ("foot-pounds") let me state that it is useful for comparing certain loads to each other. But I would stick with the same caliber when making comparisons. Its almost useless when it comes to other areas and often leads to misconceptions when it come to pitting one gun/caliber against a different gun/caliber. Such as comparing the .44 Magnum revolver to the .308 rifle. While the rifle is without question more powerful, when it comes to dropping game the .44 handgun will do the same job the .308 does, within limits. If you were to use both guns shooting at the same animals at comparable distances (under 100 yards say) there usually is not a discernable difference between the effect of either gun on the animal when hit in basically the same spot. I make that statement based on my experience shooting animals over the last 35 or so years. Over 30 years ago I was sitting around with my Dad and some friends and we were discussing the subject of hitting power. We decided we would experiment a bit. It gave us an excuse to shoot! We went out in the yard, nailed an 8 foot 2x4 onto a log that weighed about 20 pounds and hung it from the clothesline. We shot a few guns into it and were mildly surprised that none of them moved it very far. The .300 Winchester Magnum only moved it 6" or so! (all the bullets stopped in the log so it soaked up all their power) Dad took a 20 ounce claw hammer and whacked the end of the log as hard as he could and it moved it about 6". So we concluded the .300 Magnum hit about as hard as a whack with a 20 oz. claw hammer. Now that is nothing to make light of. But it isn't nearly a ton and half as the kinetic energy figures would lead us to think. 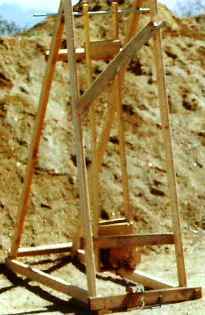 I decided to get serious about this - this was in the ancient days before personal chronographs - so we built a frame from which we hung a 48-pound mesquite log. It was hung on a 6-foot long arm and had a tape fixed to it to accurately measure the movement of the log. The log stopped all bullets fired into it. We figured out what loads we were going to shoot beforehand and had bullets of equal weight on the log. When one was fired into the log, one was removed keeping the weight of the log the same. It probably was unnecessary, but that is what we did. What we found was that some handguns hit just as hard as rifles. This confirmed observations on game in the field. If you watch the Anite Productions video DEADLY EFFECTS, the producer of the video takes a point blank shot on a vest with .308 Nato ammo .. WHILE BALANCING HIMSELF ON ONE LEG! Just to prove that the actual hitting power is not all that hard. It don't knock him down. He actually does it twice on the video just to make the point. I know someone will bring up the fact that the energy is "dissipated" over time and distance, or other such arguments. Think about it. The bullet STOPPED on the vest. All energy was expended. The .308 has over 3000 ft. lbs. of muzzle energy. Over a ton and half. Even if the bullet "lost" a ton of energy magically, somehow dissipated into the vest, it still should have enough power to knock over a 175 pound man balancing on one leg! In our tests shooting the log, the log absorbed all the energy the bullet had, even if it did take a few hundredths of a second. Don't try to argue that X amount of energy gets turned into heat, while X amount of energy moves wood particles or peels the jacket back or whatever. It's all inside the log and happens in an incredibly short space of time. Even if 3/4 of ton of that hypothetical ton of muzzle energy was siphoned off by the bullet coming apart in the log, 1/4 ton of energy should still move it more than an inch or two! 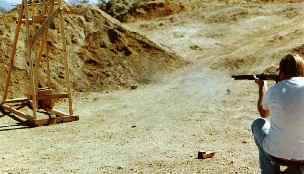 Above - a much younger Jim Taylor firing an 1886 Winchester 45-70 into the log. results. There are other methods of figuring hitting power, such as the "Taylor Knock Out" theory. It favors caliber. All such theories have their drawbacks and limitations. They are part of the quest to find a way to put down on paper what we observe in the field. And... all the different ways of measuring a bullet's power are interesting. The best way though is to get out in the field and do it up close and personal. Recorded Movements of a 48-pound pendulum on a 6 foot arm. 9mm Luger 125 gr. FMJ 5/16"
357 Magnum 2 1/2" Rem. 140 gr. JHP 1/2"
Super-Vel 110 gr. JHP 1/2"
357 Magnum 6" Super-X 158 gr. lead 7/8"
Super-Vel 110 gr. JHP 5/8"
44 Special Charter Arms Rem 246 gr. lead 1/2"
45 ACP Model 1911-A1 230 gr. Hardball 3/4"
45 Colt 7 1/2" WW 255 gr. lead 1 1/8"
300 gr. handload 2 3/4"
44 Magnum 7 1/2" Rem. 240 gr. JSP 2 1/4"
Super-Vel 180 gr. JHP 2 3/16"
30-30 Marlin Rem. 170 gr. JSP 2 3/8"
M-1 Garand WW 150 gr. JSP 3 1/4"
The big winner of the day was the old .45-70 cartridge. I shot some original UMC black powder loads with the 550 gr. bullet. These pushed the log 5 1/16"! Of course, as I stated above, bullet weight is a big factor in this kind of testing. What does it prove? Not much. A hit in the right place with a decent load will do the job. A miss with a Magnum is still a miss. Nothing can replace expertise. However, on those long winter evenings when you are sitting around with friends and the subject of which gun is more powerful comes up, here's another way to start an argument.